An heir to the throne with a ruined reputation, in permanent company of an overweight alcoholic and other dubious characters, all that on the background of rebelling earls and looming civil war – that in itself would be enough to endanger the throne’s stability. 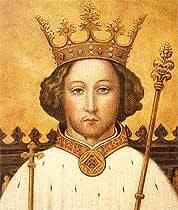 The situation is, however, aggravated by increasing self-doubt regarding the question whether all that might not be God’s punishment for the usurpation of Richard II’s crown by Henry IV and his subsequent murder – leading to nervous and unwise decisions. Henry IV is the starting and turning point of these Shakespeare dramas, but in fact, he is not the main character. The plays are, on the one hand, about the difficulty to accept the burden of responsibility, on the other hand about the life of audiences’ all-time favourite Falstaff, the personification of hedonism, at the same time mercilessly living at the expense of others. Anthony Sher is just magnificent in his role as Falstaff. He is padding around, moaning, celebrating and philosophising and he keeps a firm and joyful hold on the audience. Fabulous in his clowny scenes and just the right amount of nastiness at times when his ruthlessness shines through. Alex Hassel is Prince Hal, the future King Henry V. Throughout, from being a wayward princeling up to the breath-taking moment of his coronation, Alex makes his character palpable and believable. In the tavern, it is Paola Dionisotti as crafty Mistress Quickly, who rules supreme; in part II she is supported by Nia Gwynne as a touching Doll Tearsheet. 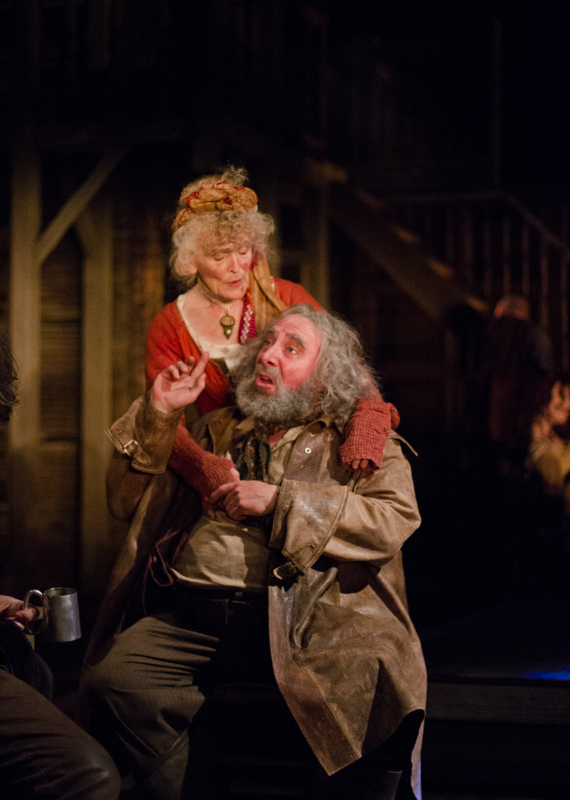 Falstaff’s and Prince Hal’s tavern mates, Ned Poins (Sam Marks) and Bardolph (Joshua Richards) keep the comedy atmosphere dense. Pistol (Antony Byrne) and Beadle (Simon Yadoo) complete the picture in the second part. The rebellious faction is initially led by Hotspur, real name Harry Percy, son and heir to the Earl of Northumberland. Trevor White plays this young rebel with his tumultuous nickname as just that, hot-tempered, hyperactive and barely controllable. An outstanding decision, at last the dynamics between those two exponential opposites, Hal and Hotspur, becomes comprehensible. Their sword fight represents a tearing pace highlight towards the end of part I, in an accomplishment second to none. Part II, with the second rebellion, the King’s illness and Falstaff’s mission to recruit soldiers, takes the scene to Gloucestershire, where Justice Shallow (Oliver Ford Davies) and Justice Silence (Jim Hooper) add new and in their subtleness absolutely ingenious comical accents. 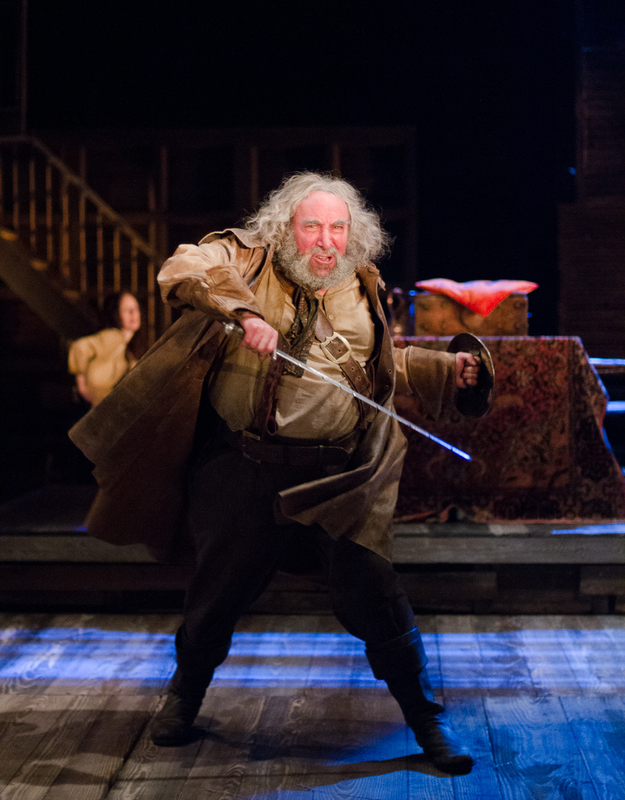 Henry IV – Jasper Britton, who in a superbly simple but impressive manner gives shape to this often neglected title character – the unsettled king dies, not without having first made peace with his son Hal. 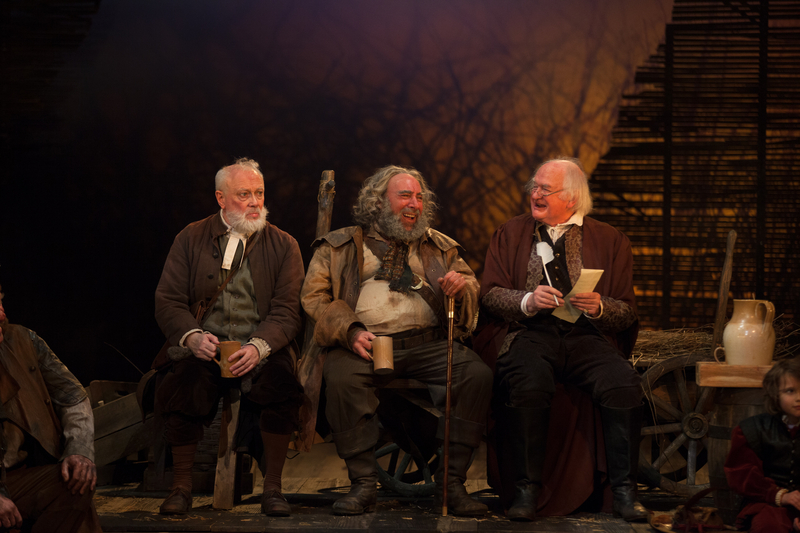 Falstaff had already imagined himself as confidant to the new king, but now he learns that Hal came to understand that he could not trust this tavern friendship. Director Gregory Doran, with these two productions from the histories cycle, has added a new double crown to this psychologically rich Shakespeare material. Apart from the above mentioned actors and many superb others, the two boys Luca Saraceni-Gunner and Jonathan Williams deserve a special mention as Falstaff’s cheeky page. 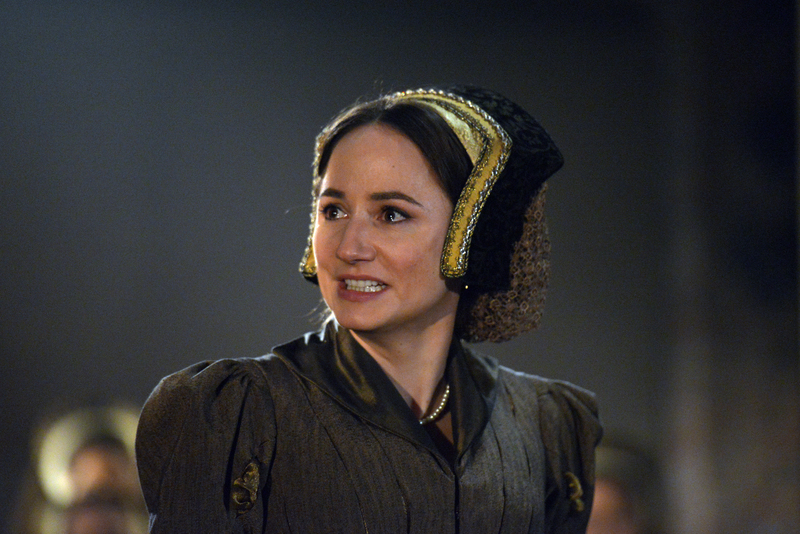 In her support role as Lady Mortimer, Nia Gwynne creates a particularly unforgettable moment in part I, when she sings for her husband in Welsh. A goosebumps moment! 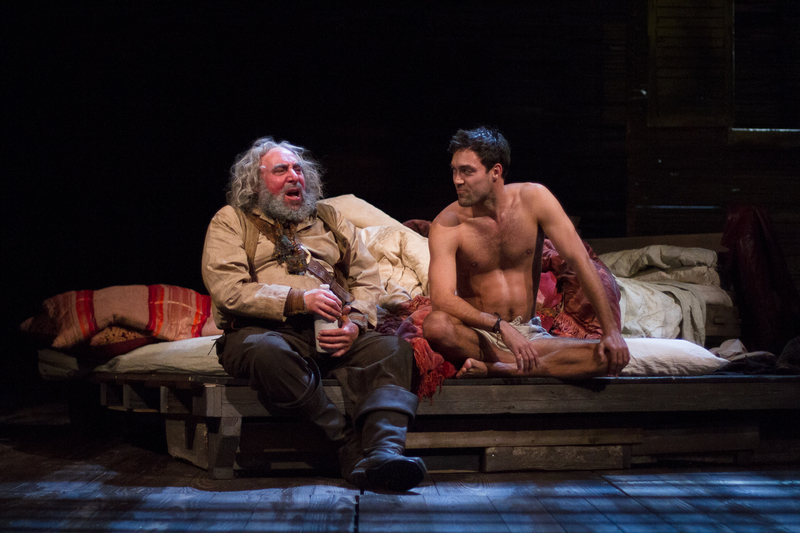 Henry IV Part I and Part II will be on stage in the Royal Shakespeare Theatre until 6th September 2014, thereafter in 7 further theatres around the country, amongst which the Barbican Theatre London from 29th November to 24th January. On 14th May Part I and on 18th June 2014 Part II will be screened live in cinemas worldwide. This entry was posted in Theatre and tagged Alex Hassel, Anthony Sher, Greg Doran, Henry IV, Jasper Britton, Jim Hooper, Joshua Richards, Nia Gwynne, Oliver Ford Davies, Paola Dionisotti, Royal Shakespeare Company, Royal Shakespeare Theatre, Sam Marks, Trevor White on May 12, 2014 by lingonews. Stratford has had a massive buzz of excitement for a somewhat shorter run: David Tennant back at the RSC, playing the lead role in Richard II – the king who felt too safe in his divine right to the throne, and consequently lost it all. Richard is also one of the kings with ongoing rumours about his sexual inclination. Tennant’s interpretation, after the early previews with just a hint of campness, has been a highly credible display of a basically insecure young man who is only sure of one thing: that he is always right and that God gave him the entitlement to do just as he pleases. Floating on stage, angelic in dress and hairstyle, ‘luvvy’ at times, a loose canon immediately afterwards, dangerously unpredictable: a weak, profoundly bored king who takes the world and its inhabitants as his toys. David Tennant rolls out his full potential, and it has left audiences breathless night after night. Especially in the second half, when King Richard is faced with the loss of everything he believed in, he is masterly. What is it about toes? Seeing a character’s emotions displayed through actors’ toes always cracks it for me… Amazing! Incredibly well done! Richard’s counterpart is Bollingbroke, later to be King Henry IV, here portrayed by Nigel Lindsay. A bit of a rough character, one is led to think, he oozes noble intentions, looks martial throughout and intimidates Richard and those loyal to him enough to make him King instead. Michael Pennington as John of Gaunt, who delivers the famous “Sceptered isle” speech in a refreshing, questioning attitude, rather than the so often used fervent patriotic approach, brings a lot of honesty to this medieval tycoon. His rendition allows one of Shakespeare’s favourite backhanders, the “What’s changed?” question, to shine through to the 21st century. 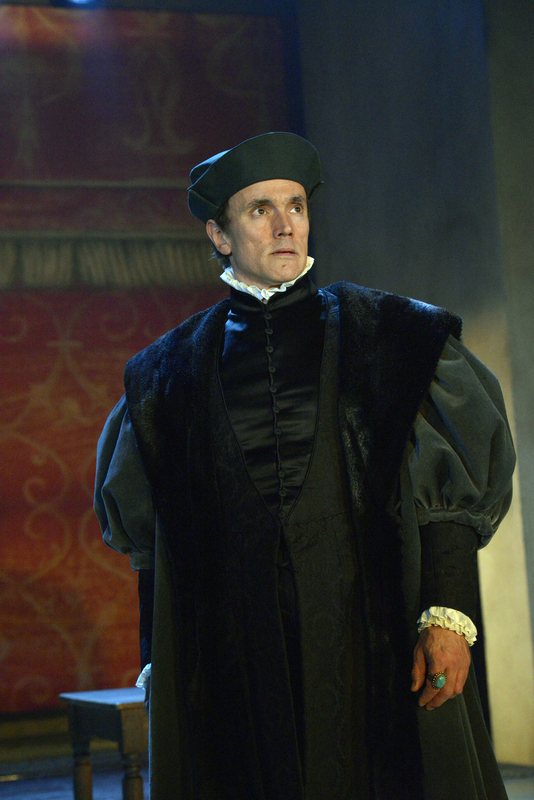 John of Gaunt’s brother, the Duke of York, is played by Oliver Ford Davies, a warm-hearted masterpiece of acting. A very special treat is their brother Woodstock’s widow, breathtakingly acted by Jane Lapotaire, who absolutely nails it in this, her first appearance on stage after ten years. Also very touching, Oliver Rix as York’s son Aumerle. The music by Paul Englishby is enthralling throughout, but especially as performed by the three sopranos Charlotte Ashley, Anna Bolton and Helena Raeburn. All of this is performed to the background of an amazing set. Stephen Brimson Lewis, the set designer, uses a lowered stage with inbuilt dungeon and a background of silvery-golden chains. Visual projection on these chains creates depth of scale and turns the view into cathedral, castle, curtain in a stunning 3-D display. 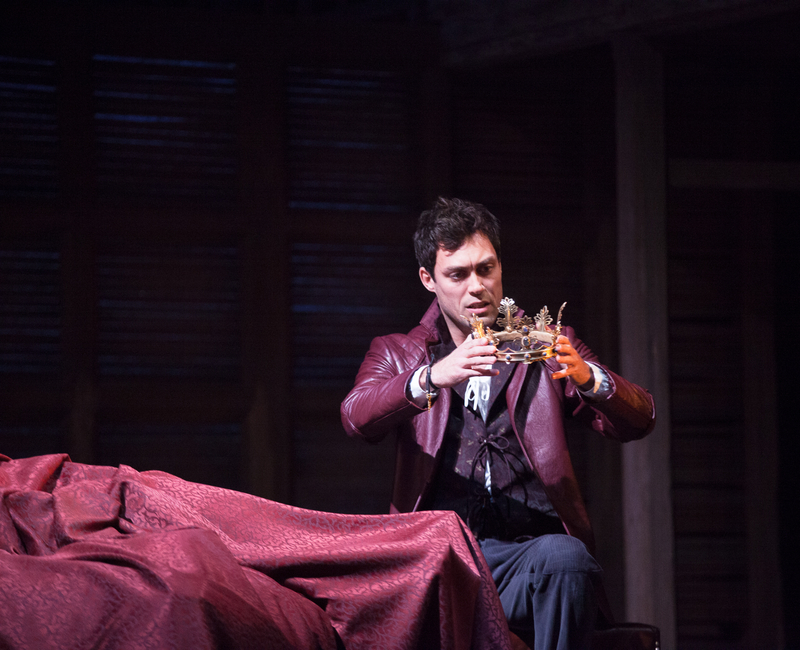 Richard II is being performed at the Royal Shakespeare Theatre in Stratford-upon-Avon from 10 October 2013 – 16 November 2013, and from 9 December 2013 to 25 January 2014 at the Barbican Theatre, London. Richard II has been broadcast live in cinemas around the world on 13 November 2013 and it is going to be shown in lots more over the next few months. 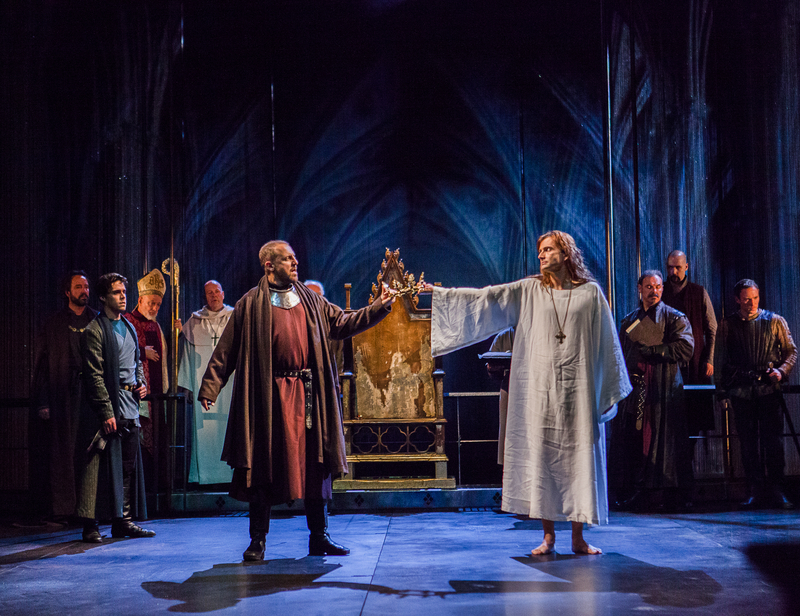 This entry was posted in Theatre, Uncategorized and tagged David Tennant, Edmund Wiseman, Greg Doran, Gregory Doran, Jane Lapotaire, Jim Hooper, Keith Osborn, Michael Pennington, Oliver Ford Davies, Oliver Rix, Richard II, Royal Shakespeare Theatre, RSC, Sean Chapman, Simon Thorp, Stratford-upon-Avon, Youssef Kerkour on October 21, 2013 by lingonews.